Hopefully, you will now understand balance sheets and how important and useful they are. Let’s move on to a set a numbers which most people think are even more important – profits. Just as we did with balance sheets, I am going to explain the numbers in an income statement in this chapter. In the next chapter, I’ll show you how SharePad turns them into useful information. When you are looking at a company in SharePad and click on the “Income” tab you will get a view of its income statement as shown below. This will tell you how the company turned its turnover into profits in the years shown. The level of detail in the income statements will be very similar to what you would expect to see in a company’s annual report. A company’s profit is simply its income less its costs. There are lots of different ways of measuring profits. I will explain what each of these mean in this chapter. How much profit does a company make? This is probably the first thing an investor will look for when they are thinking of investing in a company. A company’s profit history and more importantly the prospects for its future profits are key determinants of whether a share becomes a decent investment prospect or not. A company’s annual report and accounts contains a lot of information about profits. The best place to start looking at them is with its income statement (this used to be called a profit and loss account which might make more sense to some readers). SharePad will give you a company’s income statement which will allow you to study its profit history over a long time period. 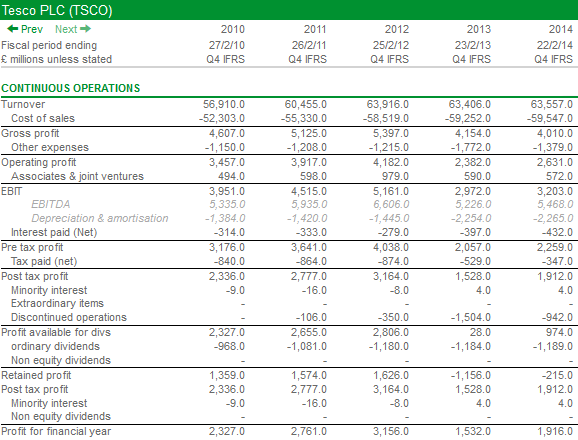 For example, in SharePad you can look at Tesco’s income statement as far back as 1986! You might not think that’s necessary, but knowing how a company performed in the past in different economic conditions is very valuable information. The author Mark Twain was reputed to have said that “history does not repeat itself but it does rhyme.” When it comes to company performance, I think this is probably true as well. The income statement shows a breakdown of company’s income less its costs for a period of time – most often a year. It shows you how a company’s income was made during the year. One thing to make clear right away is that is does not show the movement of cash going in and out of a company. That’s a very important subject that I’ll talk a lot more about in another chapter. An income statement is put together using an accounting principle known as accruals or matching. What this means in practice is that costs are matched against the income that they generate and are recorded. It does not matter whether the recorded income or cost caused cash to come into or out of the business. As I’ve just mentioned, this point will become more important later on when we discuss cash flow. Nevertheless, an income statement contains lots of valuable information for an investor and it’s important to understand the main terms within it. SharePad contains income statements for UK and US companies. They are broadly similar but there are a few subtle differences in how they are put together. US accounts have their own accounting standards (known as US GAAP or Generally Accepted Accounting Principles) whilst UK ones are compiled using International Financial Reporting Standards (IFRS). IFRS is also used across the EU. You don’t need to worry about this. The terms that will be described in this chapter are relevant and mean the same thing when applied to either a UK or US company. Here’s a brief explanation of what the main terms that you will find in an income statement actually mean. This is the first line that you will see in an income statement. It is also sometimes called sales or revenue. This is the lifeblood of any company. They don’t tend to last very long without turnover. Turnover represents the income earned by a company from selling its goods and/or services. So if I had a business and I only sold one product – let’s say beer – and its price was £1 per pint and I sold 1,000 pints during the year, my turnover would be £1,000 (£1 x 1,000 pints). Tesco sells lots of different goods at lots of different prices. In 2014, when these were all added together it amounted to a very large sum of money – over £63 billion. As you will see there are lots of different measures of profit. The first one you are likely to see on a company’s income statement is something known as gross profit. Gross profit is a company’s turnover less the costs involved with selling the goods sold (or the cost of goods sold). Let’s return to my small brewery business. We know the amount of turnover. We need to work out the costs involved in selling those 1,000 pints. In a very basic form these will be the costs of things such as water, barley, hops, yeast, sugar. But you could also include things such as the rent on the brewery, electricity, beer barrels, delivery costs, alcohol duties and wages. It’s important to understand that one company’s cost of sales might be significantly different to another’s. There is no set standard as to what should count as a cost of sales and what shouldn’t. A company’s true gross profit may also give away some valuable information about its business to competitors or customers and so most companies don’t really want to give this information away. However, if we get back to the simple example of my little brewing business: let’s say that my costs of making and selling the beer was £800. This means that my gross profit was £200 (£1,000 of turnover less £800 of costs on 1000 pints). On Tesco’s definition it was £4010m (or £4.01bn) in 2014. Gross profit can be an interesting number if based on a genuine measure of the cost of goods sold. If it isn’t, then it’s a number that probably doesn’t have much meaning. All other expenses of running the business (known as operating expenses) – however the company chooses to allocate them – are deducted from gross profit to get a figure known as operating profit. This is also known as trading profit because it represents the money made from selling its goods and services. Tesco’s operating profit in 2014 was £2631m. Stands for earnings before interest, tax, depreciation and amortisation which is quite a mouthful. As a number, EBITDA has become increasingly popular with some investors in recent years, although I’m not convinced that it is that useful (I’ll explain why in a minute). But just in case it is, we’ve included it as a measure of profit in SharePad. I talked a little about depreciation when we were looking at balance sheets. It is an expense which matches the annual cost of using tangible fixed assets such as plant and machinery against the revenues or turnover that they help to generate. There are a few different ways of calculating depreciation on an asset which I won’t get into here but the most common method is known as straight line – the same amount each year over the life of the asset. In my case it is (£12,000-£2,000)/10 = £1,000 per year. This means that my profits are reduced by £1,000 per year until I replace the machine. Amortisation is calculated in a similar way but applies to intangible assets such as computer software. As cash is only spent when the fixed asset (such as a machine) is bought, some people argue that depreciation and amortisation are not real cash costs and so should be ignored (I disagree). They are also prone to manipulation by the company directors who can boost profits by changing assumptions on residual values or extending useful lives. So by ignoring depreciation and amortisation altogether, EBITDA can therefore be seen as a cleaner measure of trading profit. It is often used by certain types of investors as a means of weighing up a potential takeover value of a business. For what it’s worth, I believe that profit has to be stated conservatively and based on something you can payout to investors. It is true that a business can go on for a while without replacing its computers and fixed assets but in the long run it cannot do that. By reducing profits with a charge for depreciation, the fact that an asset will be replaced one day is being taken – albeit not in one transaction – into account. In 2014, Tesco’s EBITDA was £4.97 billion. Is simply EBITDA less the costs of depreciation and amortisation. EBIT (Earnings before interest and tax) can end up being a very similar number to operating profit. In SharePad EBIT also includes the share of a company’s ownership stake in other companies (known as associates and joint ventures). EBIT is arguably the most important number that you will see on the face of an income statement. It represents the profits available to pay lenders (interest), the taxman and shareholders (dividends). When it comes to valuing a company it is also one of the best numbers to use. That’s because EBIT is not influenced by how a company is financed whereas other measures are (see Chapter 9 for more information on this). Investment income represents interest on the company’s cash accounts with its banks. Interest paid (net) is the money paid to lenders excluding what is known as capitalised interest. Capitalised interest is the cost of borrowed money that is incurred when building an asset and this is included in the cost of assets on the balance sheet. Sometimes referred to as profit before tax (PBT), this is the company’s total profit after most of its expenses have been accounted for. Tesco’s pre-tax profit in 2014 was £2259m. Companies usually have to pay tax on their pre-tax profits. The amount actually paid will depend on which countries the profit is actually earned in. Companies may also use certain allowances that can reduce their tax bill such as losses made in previous years. Pre-tax profit less tax gives you a figure for post tax profit. In Tesco’s case this was £1912m in 2014. However, this is not the same as profit that belongs to its shareholders and available to be paid out as dividends. There are still some deductions to be made before we get to that number. The first number to take away is minority interests. This refers to the share of post-tax profits that belong to another party other than the company’s own shareholders. For example, a company may own 90% of a business and another company owns 10%. If the post tax profits of this business are £40m, then 10% (£4m) belongs to a minority interest and so must be taken away from the company’s total post tax profits to reflect that those profits don’t belong to its shareholders. In Tesco’s case, there is also a loss of £942m (losses are highlighted with brackets) from businesses that it is intending to sell (or discontinued operations). These have to be deducted too which leaves £974m left over for shareholders. The other figure that also has to be deducted before we get to profits available for dividends is what are known as non-equity dividends. Companies sometimes issue preference shares – so called because their shareholders get preferential treatment and are paid before ordinary shareholders are – where the dividend paid has to be paid out of post tax profits but before ordinary shareholders get paid a penny. This is not an issue for Tesco as it doesn’t have any non-equity dividends. These are the profits that are retained within the business after all expenses and dividends have been deducted. In 2014, Tesco paid a dividend totalling £1189m – more than the profits available for shareholders of £974m – giving rise to a retained loss of £215m. This £215m reduces the profit and loss reserve (remember, this is the total amount of profits retained by the company since it started trading) – by the same amount on Tesco’s balance sheet. As well as the actual numbers within an income statement, SharePad gives you some important numbers on a per share basis. These are identical or similar to the ones that you would see in a company’s annual report. This makes it easier for shareholders to see what their share of the profits is for each share owned. The dividend per share doesn’t require much explanation. It’s the cash paid out per share. As you can see above, SharePad is telling you the dividend per share paid in the year and also the dividend proposed. The proposed dividend will have been announced but not paid in full by the year end. Tesco’s proposed and paid dividend in 2014 was the same at 14.8p per share. Slightly more complicated is earnings per share (EPS). In simple terms, this is the company’s profits after tax available to shareholders divided by the weighted average number of shares in issue during the year. However, companies tend to publish lots of different EPS numbers. But what do they mean? What’s the difference between them? Reported EPS is based on the profit from a company’s underlying trading activities plus the profits and losses from one-off or exceptional items. Nothing is excluded from this measure of EPS. For Tesco in 2014, the reported EPS is 12.0p. For instance, a company may have made a big gain on selling some of its assets or incurred a lot of costs shutting down a business. As you will see later, this EPS number can be quite useful for investors. SharePad also breaks down this reported EPS number into the EPS that has come from continuing businesses and discontinued ones (ones that have or will be closed or sold off). For Tesco’s 12.0p of reported EPS, the continuing businesses contributed 23.7p, but the discontinued business contributed a loss per share of 11.7p. When looking at US companies in SharePad, it is the reported EPS number which is calculated and used in other calculations such as PE (price to earnings) ratios. Normalised EPS is meant to give investors a per share profit figure based on the underlying performance of the company. It strips out one-off gains and losses (known as exceptional items) so that you can see the profits made by the existing business. For Tesco in 2014, the normalised EPS number was 16.0p. 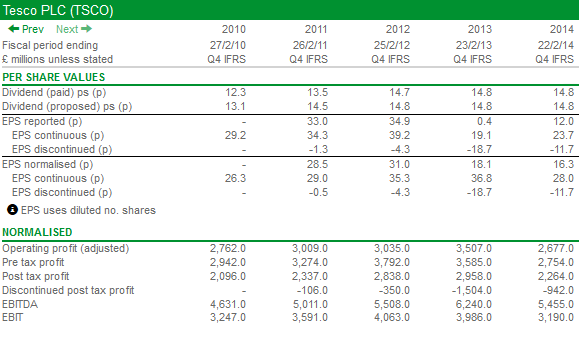 This is broken down into continuing (28.0p) and discontinued (a loss of 11.7p) EPS figures as well. This is the EPS number that companies want you to focus on. It’s the number that they want City and Wall Street analysts to base their predictions of future performance on. It’s the number they want to be judged on. Normalised EPS can be a very useful number but is open to abuse. Some companies have had a tendency to have big exceptional items every year. Exceptional items should be one-off in nature. When they recur every year it could be argued that they are no longer exceptional and could be a sign of aggressive accounting. In SharePad, the normalised EPS figure is the one used for ratios when you are looking at UK companies. In SharePad all the EPS numbers are based on a fully diluted number of shares. We do this because we believe it is the most conservative measure of EPS. Share options or warrants (options to buy shares that are listed on the stock exchange) that are in issue. Shares not eligible for a dividend this year. All the above may lead to more shares being issued in the future which will mean that profits will be spread across a greater number of shares which would reduce EPS. Fully diluted EPS takes these effects into account. In addition to normalised EPS, SharePad also gives normalised figures for key profit items such as operating profit, pre-tax profit, post tax profit, EBIT and EBITDA. These numbers are used for calculating some ratios in SharePad and are very useful for looking at the underlying performance of a business based on different measures of profit.